Like all businesses, maritime organisations must strike a balance between managing operations with the right number of employees at the best possible price. But where they differ is that these businesses require specialist and highly trained workers– and getting them to where they need to be usually depends on circumstances that can rarely be taken for granted. Travel costs for crew make up the second-highest outgoing for most vessels, and without clear oversight costs can easily spiral out of control. The fact that getting employees to the right place at the right time is a mission-critical factor means that, when faced with pressure, those managing travel can be inclined to take expensive decisions. Travel Management Companies (TMCs) that specialise in the marine industry, such as ATPI Griffinstone, can bring a sense of calm to troubled waters. When it comes to managing complex crew travel arrangements, having a TMC in your corner can provide a tailor-made and consultative approach – particularly when it comes to creating a travel policy that can achieve realistic efficiencies on a global scale. A TMC also brings proven expertise in cost control, meaning maritime businesses can concentrate on the job at hand without compromising on safety, accuracy or compliance. When working alongside our maritime clients, we typically look at three areas across planning, booking and reporting in order to deliver significant long-term efficiencies. It might sound like an oxymoron, but flexible consistency is simply about making the most of local knowledge. Most organisations have crew coordinators located around the world, each operating to different standards and with differing processes. A TMC can bring some stability to this mis-matched approach – streamlining where necessary – to tailor-make a travel policy that works. It is vital changes are made in a consultative way so that important local market variance is incorporated. By communicating changes to policy across the business it is easier to get ‘buy-in’ from coordinators so they follow the correct procedure and ensure that bookings are always compliant. If the number of incorrect bookings rises, then so does cost. Simple errors, such as having mis-spelled names or visa errors, take huge effort and time to correct and also cause unnecessary stress – especially when staff need to be on a ship for a particular deadline. Human error is usually to blame in these circumstances, typically when information has been transferred manually across platforms in an old-fashioned way. End-to-end workflow management systems such as ATPI’s CrewLink platform can take away this risk by seamlessly integrating HR and finance systems. This allows personal data to be captured so visas and other essentials can be managed easily. Profiling tools like ATPI’s eProfile ensures data is always accurate and consistent, allowing the booking process to occur as smoothly as possible. The best way to see how to save money is to know exactly how it is being spent. That means being able to tap into the huge amounts of data generated by crew changes and travel. TMCs are experts in managing this information and will put the processes in place so that organisations can identify efficiencies. Consistent reporting of results – including across different global locations - is vital here, since data can then be compared and understood easily. This allows different elements of the travel policy to be studied and costs driven down where possible. Putting your travel programme in the spotlight is a great way to think differently about your business, and will almost certainly deliver intelligent rewards beyond just cost. 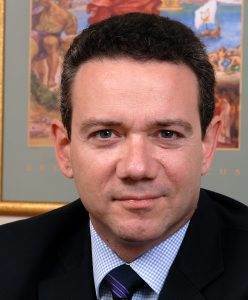 Nikos Gazelidis is Global Head of Shipping at ATPI Griffinstone, the specialist marine and energy division of the travel management and events business, the ATPI Group. For more information please visit www.atpi.com/griffinstone and the ATPI Knowledge Hub.